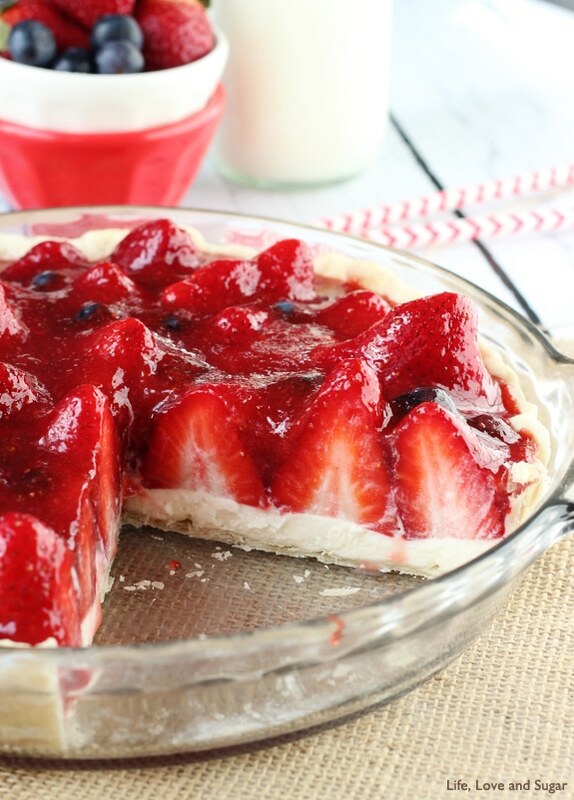 This Strawberry Cream Pie is the stuff dreams are made of. It is strawberry and cream heaven and as soon as I tasted it, I knew I’d be in love forever. So did you guys know that today is Pi Day?! You know, as in March 14th —> 3.14 – like the math number? All the math geeks come out in droves, fill the streets and eat pie until they explode! My contribution is this beautiful and delicious Strawberry Cream Pie. I’ve actually been wanting to make this pie for quite some time. Since last summer, as a matter of fact. I have always loved strawberries, especially when covered in sugar which is basically what this pie is. So let’s talk about what’s in it. I went easy this time and used a Pillsbury crust. You don’t have to worry about making the dough and letting it refrigerate, which is quite nice. Follow the instructions on the box and you will have one great crust. It compliments the pie perfectly! Next is the cream filling. I actually went a bit light on the cream. Some versions of this pie have twice the amount of cream, but I opted for less. 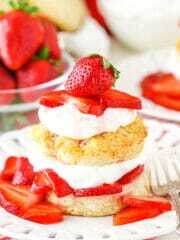 I really love the flavor of the strawberries and didn’t want it to be overpowered by too much cream. I totally think it was the right call. Just the right amount. 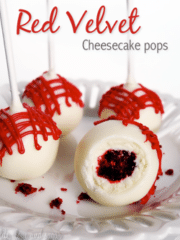 It’s made from a simple combination of cream cheese, whipped cream, sugar and vanilla. Make that and spread it in the slightly cooled crust. Next is the strawberries. 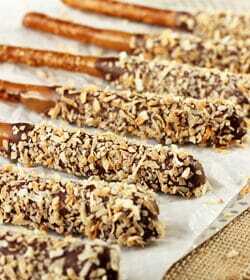 You’re going to want to cut the stems off of the ones that will go on top of the filling. Those stems wouldn’t be very tasty. Making the glaze takes a little longer – 15-20 minutes – because you slowly bring the strawberry mixture to a boil, but it’s by no means hard. Just a little patience required. 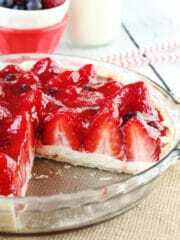 Once the glaze is made and slightly cooled, you pour it over your strawberries on the pie and refrigerate for about 4 hours or more before serving. This will seriously be one of the best things you’ve ever tasted if you dig strawberries. And the hubs was completely in love with it to. I hate that I can’t better describe to you in words how good it is. I wish I could hand out samples through the screen. The day after we finished the pie, I got a text message from him at work telling me how sad he was that the pie was gone. That’s a first! 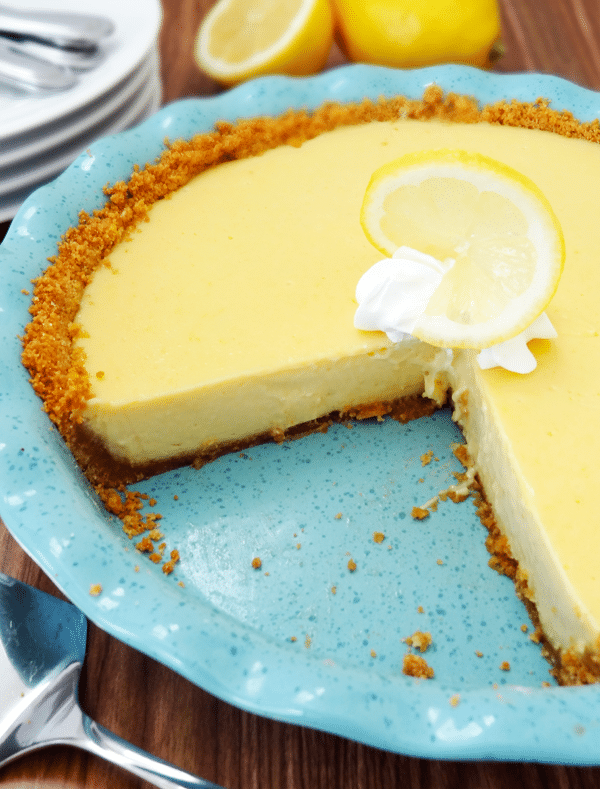 So join us in celebrating pi with pie! 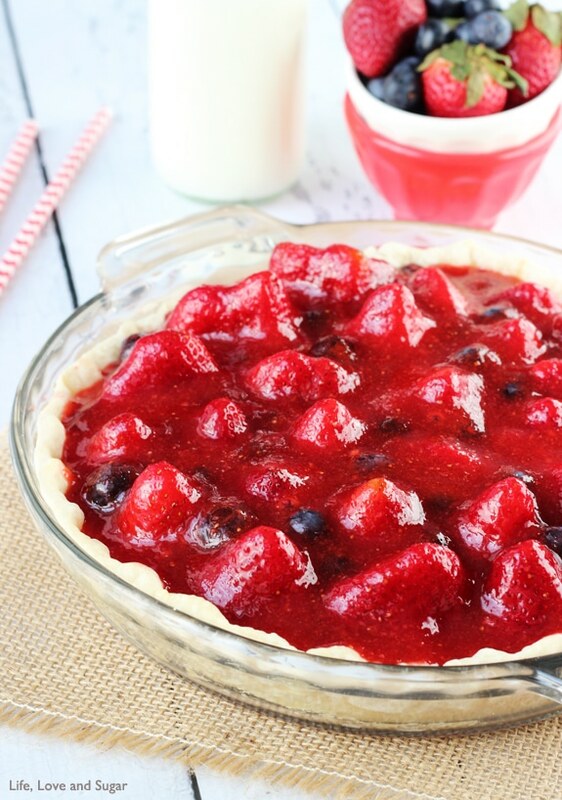 Strawberries are on sale like crazy right now, so this pie is perfect! Be sure to check out the amazing pies from all the other bloggers in the collage below! And a big thanks to Julie from White Lights On Wednesday for organizing everything! What a talented group! 1. Bake pie crust in a 9 inch pie pan according to package. Set aside to cool. 2. 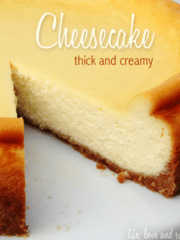 Beat cream cheese, sugar and vanilla together in a medium sized bowl until smooth. Stir in whipped cream. 3. Pour filling into pie crust. 4. Add 1/3 cup water to pureed strawberries. 5. Combine sugar and cornstarch in a saucepan. Stir in strawberry puree. 6. Cook over medium heat, stir constantly until mixture thickens and come to a boil, about 15 to 20 minutes. 7. Allow to boil for 1 minute, then remove from heat. 8. Stir in vanilla extract and allow to cool for about 10 minutes. 9. 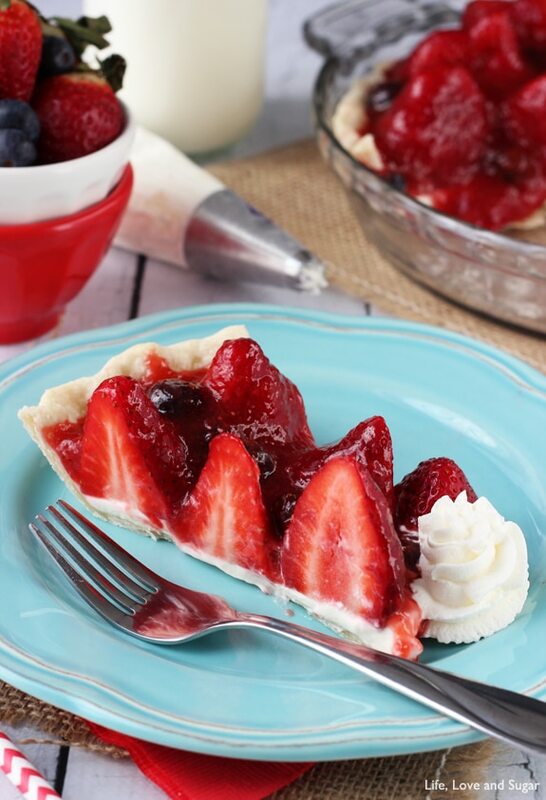 While glaze cools, place blueberries (if using) and whole, de-stemmed strawberries on top of the cream. 10. Pour slightly cooked glaze over top of strawberries and blueberries. 11. Refrigerate at least 4 hours before serving. This post linked to Buns In My Oven, Wine and Glue, Gingersnap Crafts, Lambert’s Lately, Living Well Spending Less, What’s Cooking Love? Girl your pie-cutting skills are on point. Looks delicious! Love the glaze too, I’ve never made glaze from scratch but that looks radically easy. Happy Pi day! Thanks Lisa! 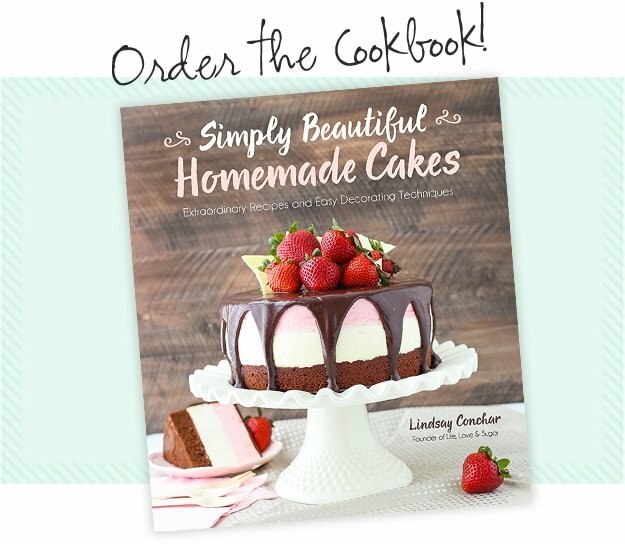 It was definitely easy to make – and so tasty with fresh strawberry puree! This looks too good to eat! I’ll try to overcome that and eat it anyway!! Holy cow! I want to dive head first into that pie. 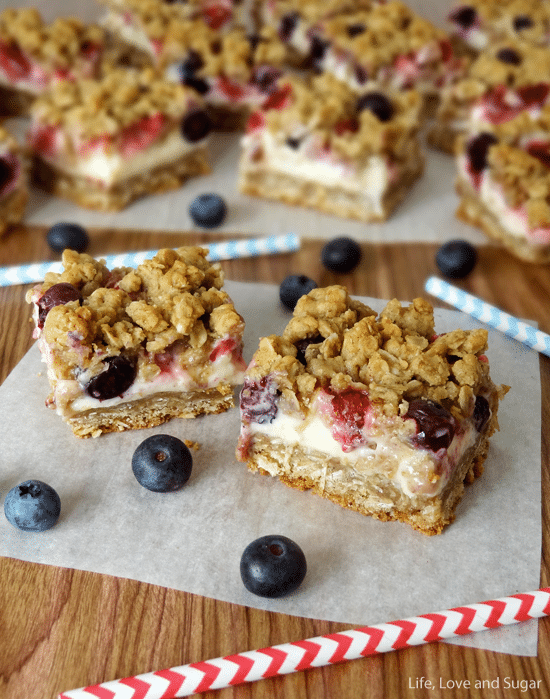 Strawberry, blueberry, and cream…it’s amazing!!! 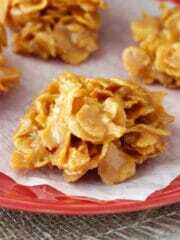 I am SO craving this for breakfast! 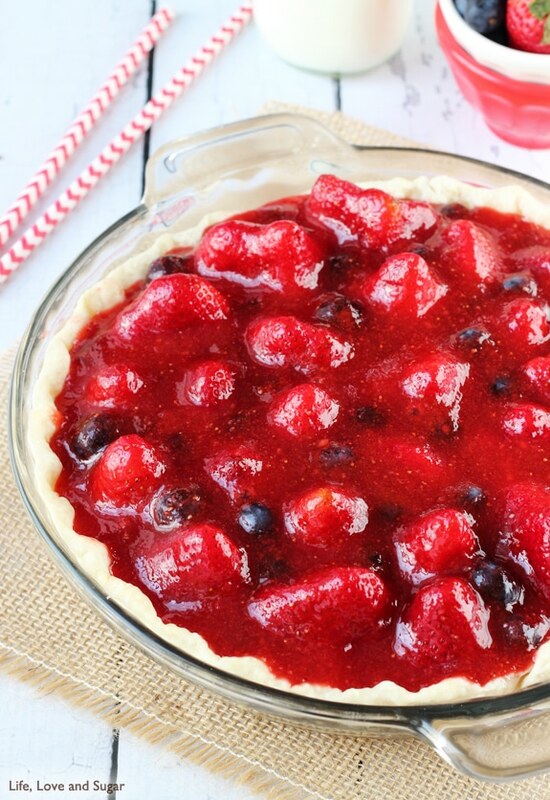 Strawberry pie is my favorite! This pie looks incredible! It’s my new favorite too – so good! Thanks Jessica! This pie looks awesome Lindsay! 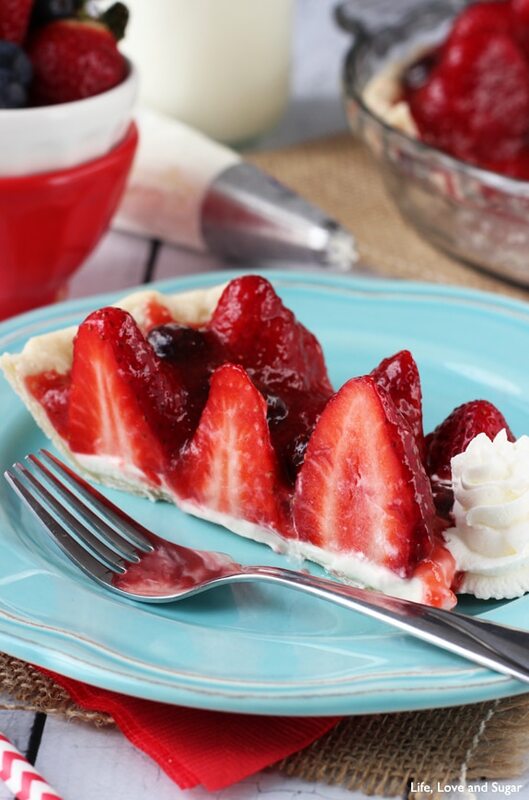 I love strawberries and cream together – especially in pie! Pinned! 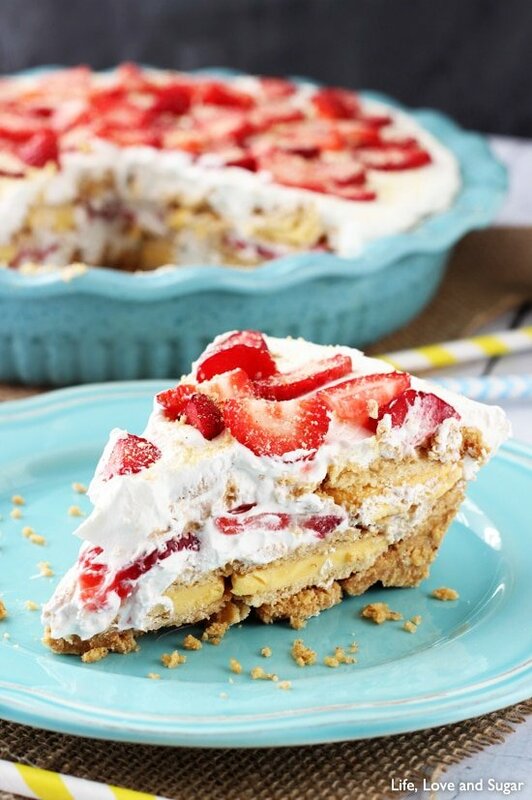 This pie looks fantastic! I really love the addition of the cream to the strawberry pie, I bet it tastes great! What a yummy pie Lindsey! I love strawberries! This looks perfect to enjoy on a hot summer day!! Thanks Renee! It’d definitely be great for summer! Oh wow! 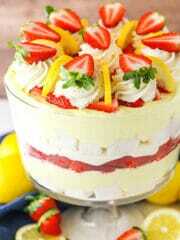 That looks so bright and pretty and like I need to eat it! I love strawberries and adding the blueberries would be the perfect pairing. YUM! This is one GORGEOUS pie! The filling sounds AMAZING and I don’t think I would be afraid to lick the bowl! This looks so good! 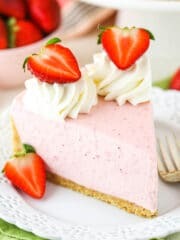 🙂 I haven’t had a good strawberry cream pie in a while. Pinning this one to make soon! Thanks Carrie! I hope you like it! 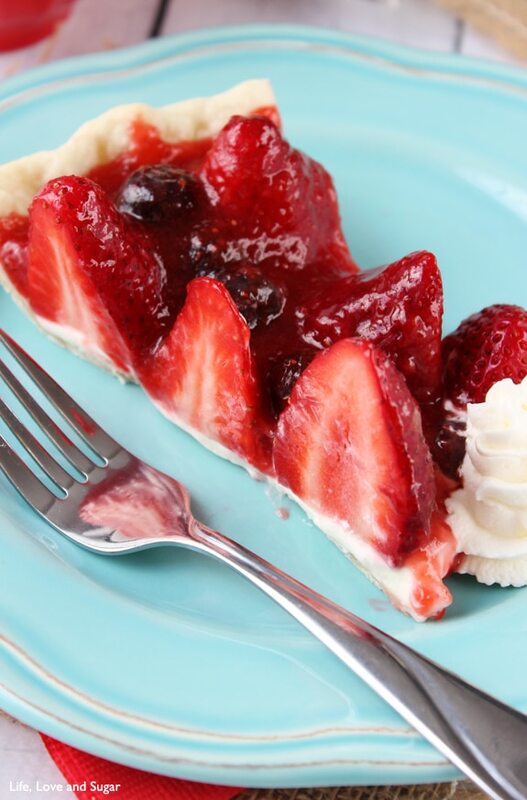 We love strawberries too and eat them all year, but for some reason this luscious pie makes me think of the summer! 🙂 After such a cold and miserable winter, summer thoughts are very welcome. 🙂 Beautiful pie, Lindsay! Thanks Wendy! I couldn’t agree more – I’m over winter! 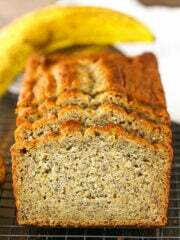 I’ve never made a recipe like this one, but I think I’m going to need to try it soon! Thanks Ang! And thanks for the pin! I made this Strawberry Cream Pie for Pi Day 2015 — it was DELICIOUS! (I did double the filling because we like the cream part.) However, I did feel that using the standard pie crust did nothing for the pie, flavor or texture-wise. My husband suggested a graham cracker crust, my MIL suggested a Nilla Wafer crust, both of which would be tasty options. 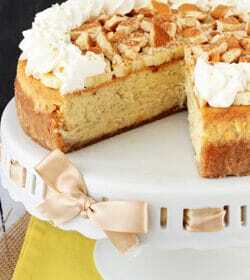 I think a baked shortbread crust is probably the flavor and texture I would like most with this fabulous pie. We enjoyed eating this pie so much that I made it again a week later using blueberries and Ritz cracker crust — and that was fabulous too! Are the strawberries whole and standing up on end or halved? They are whole inside the cheesecake. I’m so glad that I subscribed to your website. Everything here look’s so delicious and you definitely have a lot of talent. I will be making the pumpkin chocolate chip bundt cake since I have all the ingredients to make this. I look forward to making some of the ice cream cakes for the Summer ; so much better than buying them plus I can say that I made it! 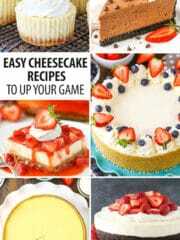 Great job with the recipes! God bless you. I’ve made this pie twice now, and my husband and I love it! So delicious! 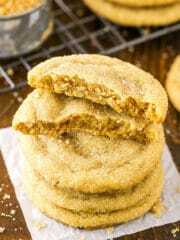 I’ve also tried it with a graham cracker pie crust, and it’s also amazing that way! Thanks for sharing! Awesome! I’m so glad you both enjoy the pie!